Everyone who enjoys music has at least one album that is THE album for them. I have ten of them--at least. One of the side effects of having too many interests and an intense love for music makes this the case for me. Rather than trying to just say "I like a bunch of stuff", I've embraced my diverse tastes. The ten albums in this list are important to me in some way. They might not be my favourite albums necessarily or even albums that I deem are the best for the artist, but they may have helped me through a difficult time in my life, or may remind me of a happy time. It may even define an entire era of my life for me. Music has a deep impact on how I live my life--it always has. With each album on the list I have included either my favourite song on the album, or the song that got me interested in the album in the first place. I tried to rank this but it was very difficult, other than the top three. So, here you are. I don't really have a reason for this one in particular. I preferred Unia as an album on the whole, but this album in particular reminds me of cool autumn mornings, gaming before dawn and taking long walks through fallen leaves while sipping coffee. I love this album and there's something really magical about it that I can't put my finger on. While Flag in the Ground may be the single from the album that initially got my attention, Deathaura really sets the tone and prepares you for a mysterious journey. When I listen to this album, I want to write. Or go on an adventure. Or... both. When I was 13, I couldn't get this album out of my head. It was the first time I'd ever really listened to an album and thought "this is what I want out of music". While it was often blown off as silly pop, something about it made me see more. I saw past the cartoon pair of Simon and Milo and felt like I understood what Jason and James, the real musicians behind it all, we're trying to say. My prepubescent fawning over the Backstreet Boys and the Spice Girls aside, Prozzäk was my first foray into the world of following bands. I still regret that I never got to see them live. My fondest memory is having one of their questions answered enthusiastically by them on a live chat. For the record, I asked them if they were influenced in any way by the Buggles' Video Killed the Radio Star. They were. At the end of last summer, this album appeared. I was already a Mother Mother fan, particularly of their masterful O My Heart. I'd seen them live twice. I still wasn't expecting the haunting surprise that awaited me with The Sticks. This is one of the few albums that I can listen to the lyrics and really get them. It's all about packing up your stuff, getting away from all the crap in the world and moving out to the boonies--the sticks, if you will--with the animals. Wow, is that ever something I can get behind. I've mentioned my love for Nightwish before--in fact, it can be hard to get me to shut up about my love for Nightwish. I first heard of them upon stumbling across Sacrament of Wilderness before their music was even available on North American shores over ten years ago, and I've been happily hooked ever since. Oceanborn was the first metal album I ever listened to in full. Kind of like a gateway drug. I found myself instantly wanting more. Ever heard a commercial and had an urge to know what the song playing in the background was? That happened to me when I was 15. I'm sitting there, watching TV with my parents, and a GAP commercial starts playing. Something about the catchy guitar and the somehow innocent vocals grips me and I suddenly have to know what song this is. Instead of doing a simple web search, I go right to the GAP's website and send them an e-mail. "What song is playing on the commercial with the two dancing robots?" I ask. "That's Digital Love by Daft Punk," they reply. And lo, an obsession is born. I realise immediately that they also did Around the World and One More Time and that I like both of those songs, too. The next day we're taking a trip to Nova Scotia, so I stop by FutureShop to pick up the CD on the way there. I proceed to listen to it on repeat--for the next 4 months. I know, I know. Two Daft Punk albums in a row. Deal with it. This year has been rough for me, and having something to look forward to really helped me out. Finding out that a new Daft Punk album was coming in May was that shining beacon in the future for me. And when the album came, I sat in the car with friends as we drove all over the city, listening to it for the first time. The sun shone through the windows and made the promise that summer was on the way--and what a summer it would be. Something about the fluttering flutes in Motherboard and the bombastic finish that was Contact made me want more out of life. I was happy again. If you like video games at all and have a PS3, you owe it to yourself to play this game. Part of what gripped me in this game's beauty and simplicity is the flowing, beautiful music. This game's music is more than just a soundtrack of a video game, though. There's something about the soaring strings in Apotheosis that never fails to make me cry, and something in I Was Born for This that reminds me that everyone is important. The soundtrack to Journey isn't a pleasant instrumental album, the entire work is life put to music. Apotheosis in particular is like the reflection one has at the end of a particularly difficult, but worthwhile, year. It is everything summed into one--the beginning and the end. Everything about this soundtrack makes me think of experiences I've had, sweet and bittersweet. I had barely gotten to the point of fully understanding that Nightwish was my favourite band before their lead singer, Tarja, was dismissed. 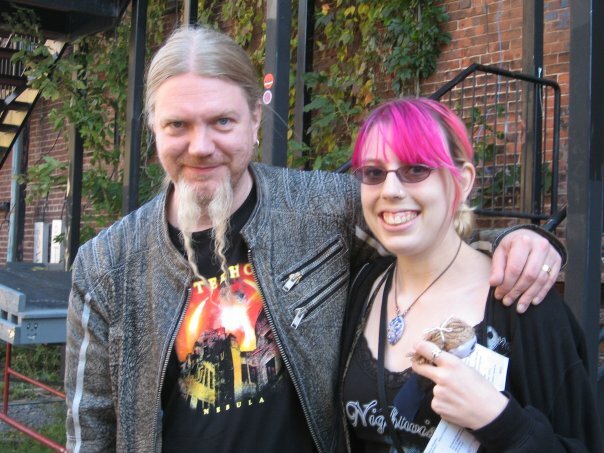 Shocked and terribly sad, I had thought that Nightwish's days were over. But then, in the spring of 2007, an angelic new voice came to the surface through Nightwish's new single, Eva. What followed was a musical obsession unlike any other. I spearheaded a YouTube movement (that will remain unnamed because this was half a decade ago and quite frankly I'm a little embarrassed) revolving around Amaranth, I travelled to Quebec three times and even made an Eva doll, which I gave to the band before the first show. Anette took the doll onstage while performing the song. I spent a whole lot of time loving this album. I even ended up taking singing lessons because of the aforementioned Youtube movement. It came at an odd time for me, too, because I was experiencing heavy anxiety, depression and generally was having difficulty getting through my day. Not to mention, I had no idea where my life was going or what to do. Dark Passion Play was the one consistent thing in my life that I could go to and be happy. While it's not my favourite Nightwish album for the songs, it is certainly the most important album Nightwish has released, in my mind, and is still a masterpiece in its own right. I've also spoken of my love of Kamelot before--very recently, in fact. The Black Halo is my all-time favourite album of any band, ever. This was the album that sold me on Kamelot and, to this day, is my go-to when I can't figure out what I feel like listening to. The summer of 2009 marked my first full year working full time, and between not being in school and not having as much time to work on writing as I used to, I wasn't particularly happy. Add the fact that Brad and I worked opposite shifts and didn't see much of each other, I was lonely too. When we were driving anywhere together during this time, he would play The Black Halo in the car. I had heard bits and pieces of it before, but the more I heard it in its entirety, the more it grew on me, and the more it spoke to me. I bought my own copy of the album and listened to it on repeat for weeks. Somehow it filled my loneliness--it became a friend. The Black Halo is a concept album based on Goethe's Faust and tells an exquisitely crafted tale of sorrow and betrayal, with the main character, Ariel, played by former Kamelot vocalist Roy Khan. By the end of that summer I felt that Ariel and I were old friends, confiding in one another on a daily basis. I don't need to go into too much detail as to why this is the number one most important album in my life. I helped to create this album. I sang on it and performed live with it. It is the first album I've been on, and hopefully not the last. I loved the process of recording and performing and would love to do it again some day, maybe in a higher capacity, and maybe not. Rosedale was my first entry into the world of professional music and performance and I've been bitten by the bug. I really, really like music. I'm sure there will be other albums one day that will grip me in the same way these ten have, and I really can't wait to listen to them. For the moment, though, this is what I have. Eventually, I'll probably write a bit about various summer soundtracks as well. I associate a lot of images and sounds with memory, as I'm sure a lot of people do, and spend a lot of time with my head in the clouds. Experiencing nostalgia is a daily occurrence for me. As a bit of a case in point, I started playing The Legend of Zelda: Wind Waker HD yesterday, and with the opening cutscene it occurred to me I hadn't played the game in eleven years. The theme music sent chills down my spine. I won't lie: I'm not really sure how to end this. So I suppose I'll shamelessly promote my Youtube covers project. Give it a look if you're interested in what I've been up to lately. It's relevant to the topic at hand as I cover songs from a lot of albums listed in this top ten.